In the early 1990’s FIFA named Soviet soccer player Lev Yashin as one of the best soccer players of the 20th century, and even today he is considered to be the best goalkeeper in the history of the game. There have been very few players who made a mark in history the way Yashin did, he was nicknamed the ‘black panther’ due to his unmatched athleticism, daunting physique and agility when it game to goalkeeping. Despite the numerous titles he won and the legendary saves he remained a humble spirit in a sport filled with arrogance and pride. In fact it was his humility which set him apart from other soccer legends and made him even more likable and approachable. He was also the deputy chairman of the Football Federation of the Soviet Union. Lev Ivanovich Yashin was born in 1929 in Moscow, Russia into a poor family of industrial workers. A large part of Yashin’s legendary humility despite being a soccer legend stems from the fact that he never forgot about his humble roots, his family were so poor that they had to live in a tiny one bedroom flat with other relatives. Due to World War II the young Yashin’s family had to flee Moscow and then returned a few years later when Yashin was a teenager. The youngster took up a job in a weapons factory and started spending his free time playing football with the factory team. It was there where his talents were discovered by the Dynamo Moscow team and he soon found himself playing for the team as their goalkeeper. After two lacklustre first seasons Yashin found his momentum and made a strong name for himself there. Yashin’s name is credit as being the only one which changed the way the sporting world see’s the goalkeeper position – he added more to the position by bringing his athleticism and overtaking techniques and kicks to the field. His tactical innovation of the goalkeeping position is what is alive even today. He was an excellent goalkeeper who recorded more than 270 clean sheets throughout his career – in other worlds he was the perfect goalkeeper. According to FIFA stats Yashin saved over 150 penalty kicks in soccer, more than any other goalkeeper. Yashin was the goalkeeper for the Soviet team and played a total of 78 games. With Yashin the team won the 1956 Summer Olympics in Melbourne, the 1960 European Nation’s Cup and took part in three finals of the FIFIA World Cup. His best performance in the World Cup’s has been finishing fourth place in 1966. In between 1950 and 1970 Yashin guided his team to winning the Olympics (1956), Euros (1960) and five Soviet championships and three Soviet cup tournaments. In 1967 Yashin was awarded the Order of Lenin – the highest honour bestowed by his country. He also won the Balon d’Or – an honour given to Europe’s best football player. A statue of Yashin can be found in Moscow square, it was made in 1997 in his honour. 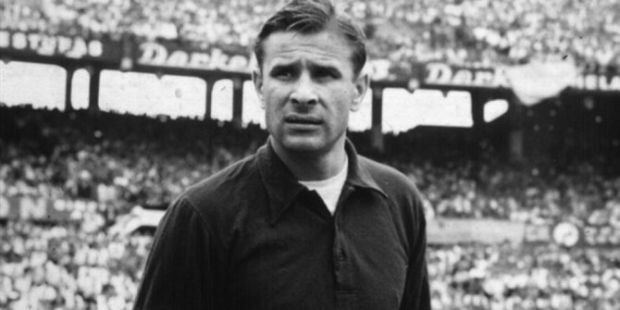 Today the best goalkeeper award is called the Lev Yashin Award in his memory and remarkable achievements. Even today young goalkeepers still dream of reaching his landmark clean sheets record and joining the legendary ‘Lev Yashin Club’.